I vented out loud as I tossed another rock. How can something be both blessing and #curse? “Easy,” the old man said. “It’s all about perception. Like treasure and trash.” He patted his ancient rock wall and nodded toward my rock pile to illustrate his point. “I spent a #fair bit of time building this wall,” he said. “But I started out like you. Cursing my treasure and throwing it aside like trash.” I looked at him, eyes wide. “You’re kidding, right? That wall must be more than a hundred years old.” He winked. “Your turn now. My mind rebelled from what I was hearing. A curse of this sort in this day? Such an #alien concept. It just couldn’t be. Yet, some urgency compelled me to ask questions. Get more information. Just in case. My need to know overrode the need to run and I turned back. “My suggestion,” the old man offered, “is to make that day count. Don’t run to town crying for help. No one listens to that. Think about it. What brought you here?” I considered that. It was the promise of a little #green. A quick job for quick cash. “A name,” I said through clenched teeth. “Give me a name, old man.” I’d had enough of this old man’s senile ranting. “I can’t. It’s #secret,” he said. My fear dissipated, leaving rage, driven by irrational, insatiable curiosity. It surprised me to feel such depth of rage. “I should go,” I said, the rest of my sentence silent. *Before I hurt you, old man. * But try as I might, I could not get my feet to move. He shook his head slowly as he watched. “Even if you #jerk them, it won’t help,” he said. “Listen up now. It’s happening,” the old man whispered. “Keep track of time. Count today.” A #shadow passed over me. I still couldn’t move and I panicked. “Don’t worry. You will feel #love again. And hunger… I’m so hungry. And I #love you.” He faded and I cried out. “#Temper your anger with purpose. Mark your days without fail…” The cursed earth’s grip on my feet loosened as his voice dissipated. In the first hysterical moments after, I slammed the invisible boundaries of my incarceration, bloodied nose and toes for testament. This has been a #twitterfiction story. Thank you for reading! 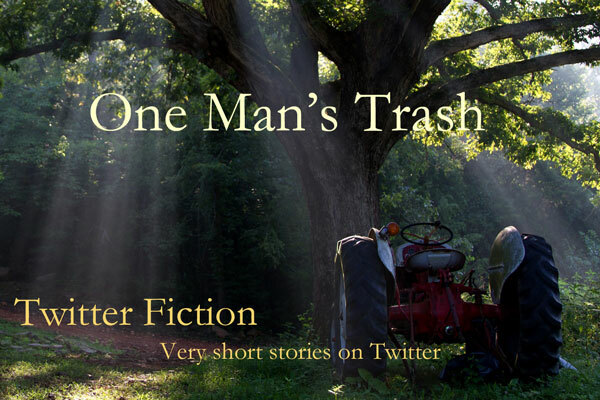 One Man’s Trash is a Twitter fiction story by @erthwitch in response to the #vss365 prompt on Twitter by @flashdogs. To find out more about what these hashtag things mean, read my post about Twitter fiction. The hashtag marks the word prompt of the day. By clicking on it, you can read all of the other stories on Twitter that used the word to create a very short story. Some of them are ongoing parts of larger stories, like mine, but some are complete within themselves as individual story tweets.